We love celebrating surfing and innovation, it is the creed by which we hollow out our existence as the Surf Bunker, it is the very essence of every keystroke. There are those who like to analyse the difficulties faced by a surfer from anywhere in the world and then innovate to produce a solution. The focus of such people is occasionally to produce something truly outstanding, and has a real functional use for us surfers, meaning, we can get on and feed the dirty addiction that is surfing. During this whizz-bang moment of celebration, it would be remiss of us not to throw one of the greatest innovative brands in the test ring to see what the team make of their huge range of products. Products that make difference to everyday surfers' lives. 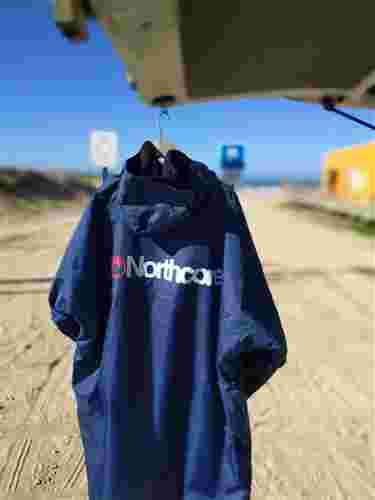 I am, of course talking about the UK based surf brand Northcore. From their humble beginnings designing the original Key Safe, the Key Pod (locks your car keys in an exterior combination safe that can hang from any car appendage) to their huge range of products now available, they are always looking at ways to improve our lives as surfers. Lovely people. Like slipping into a dry glove for your body. So the challenge set, it only remained to pick a few items that looked like they showed real promise. I hadn’t checked out Northcore in a while and upon chasing down their URL I was kind of overwhelmed at actually how many products the boys have up there. I wanted to try something different, something that I had not tried before and most importantly something I don't think I need. I had it. This thing has many names in the surf world from towelling robe to Robie (actually a brand), all we know is the Northcore version is called The Beach Basha Pro. 1- I have been blessed, through a mixture of superior DNA and blind luck, with an ample covering of luxurious hair on my body, helping me keep warm when needed. With this advantage in mind, I have always shunned the help of any garment that assists in warmth while getting changed, labelling them as something that is needed by my ‘body bald’ friends. With this anti-sentiment towards the product in mind, I surmised the testing would be thorough and with prejudice. In the test rack. All hail the quite cool looking Beach Basha Pro from the boys at Northcore. 2- Upon close virtual inspection, the thing looked to be (as a lot of things Northcore) of good quality and with that touch of superiority about it. I was excited to see if the boys at the Core had managed to improve on Nature itself. 3- It was a bloody cold winter, I am getting older and I am finally admitting that I might need some extra warmth over and above what Nature has provided. All in all, it was a no brainer. The following narrative is me trying in vain to pick apart this latest offering from the boys at Northcore, The Beach Basha Pro. There is nothing like a happy postman. The Surf Bunker office is situated on the edge of a very small village, close to the ocean in a very non-touristy part of the country. The postman, who has normally got it in for me because I make his job a lot more difficult, beeped his horn, waved a parcel at me and smiled! It's always disconcerting when someone who you are sure dislikes you smiles. It can mean one thing. Something bad has happened. As it turns out, nothing untoward was afoot. He had my package from the boys at Northcore. I was eager to see their Basha and hastily laid waste to the packaging. The Basha comes snuggly sheathed in a 'Gore-tex like' bag (not actually Gore-tex) for travel and the first thing that struck me was the weight of the item. It is damn heavy. Next is the smell, I love that new item fresh smell. Like the smell of a new book, eh hang on, is that glue? Ah well, it has that new product smell and really the whole thing screams quality on quick first inspection. I hung up the Basha and decided not to get too excited, I wasn't supposed to like this thing after all. The Basha would wait until the isobars dictated the correct conditions for a proper testing. While I am not quite at Chewbacca's level of natural protection from the elements, I am not far away. Determined to give the Beach Basha Pro a run for its money I waited until a wintery day that would freeze the balls off a brass monkey (means it was cold). The day came, it was a Friday, the spot was a touristy break and there were a lot of vans and cars in the car park. It was morning and very windy off-shore. Air temp was 4-5 degrees C, cloudy with spotty showers. Perhaps just cold enough that my own superior natural body down might not cut it alone. It turns out there is an awkwardness about using a product like this for the first time. I had spent so long dismissing the use of changing robes that I had never really noticed how many people use them, especially on this cold morning. They seem to come in many shapes and made from lots of different materials. It was a little strange then when I unveiled my shiny and high tech looking Basha. I felt like a learner driver that had pulled up in daddy's Ferarri. Northcore and needessentials swing together waiting for their turn. Lots of people were checking out the Basha, the weird thing was, I was getting changed with an audience and I had never done this before. I did not know the logistical movements of said Basha, wetsuit and nether region. One false move and I would be on full display. No pressure. While negotiating with all the moving parts of the changing conundrum I did not really notice any kind of loss of warmth. I remember the faintest breeze on my undercarriage and thinking how pleasant it was. It is strange that I would consider getting changed in 4-5 degrees C and howling wind as in any way pleasant. Through my non-flashing policy, I was a bit distracted and decided this would be a trial run. We would wait for another appropriately cold day. The wait was short-lived, this time there was a call on the emergency surf phone telling us it was going off. I looked out the window at the lashing rain and 8-degree weather. The Beach Basha was a go. If you haven't got the eqipment then don't go outside. This time I was with another writer from the office, Nic, and he (not being blessed with the bountiful natural down of my good self ) was a little chilly. That's when (to his annoyance) I whipped out my Basha. Superior DNA and now the best changing robe on the planet. Hang on, I am supposed to be tough on this Basha. Right about then, a squall came through, the wind switched directions and picked up by about 30mph. The rain picked up both in ferocity and velocity but I just flipped up the ample hood in defence while hearing cries and screams from my comrade. Hehe, this was fun. There was a lot of rain and none of it managed to get through the hard shell 'Gore-tex like' (not actually Gore-tex) outer layer, I remained warm and thanks to the double zip, getting changed was easy (once I had it down). The hood is very comprehensive and helped keep me warm and rain free. A decent piece of kit then, this Beach Basha Pro turned out to be. Does what it says on the tin and more. Upon getting out of the water, now that's where this thing really shines. When you are cold, wet, stoked and tired. Fingers fumbling and numb the Beach Basha means you don't have to rush, it keeps you toasty (and actually drys you off too) and warm, giving you time to get that arsing wetsuit off on a cold day. So was I softening towards the Basha and it and it's ilk? I guess I was a bit. The Beach Basha Pro is made up of two layers, the first is a long sleeve terry towelling material which does have a quality and sumptuous feel to it. The second (and this is the most impressive bit) is a hard shell outer layer that Patagonia would be proud of. This layer has an extremely 'heavy duty' feel to it and while Northcore's website says it is only 5K waterproof, I would be willing to say it would go above and beyond. Inner and outer layer. Together there isn't much it will not protect you from. The two layers zip into each other, meaning you can use either independently. Warm day and raining, take the outer layer. Summer and windy, take the inner layer. The North Pole and brassic, then get combo-ed up, zip them together and stride onto the beach with no fear. The zipper up the front is double zipped which really helps when rummaging around with wet garments and helps not expose one's lower faculties to the world. The design has been thought out well with velcro fastening points in the cuff and around the hood, helping the Basha feel like a proper and solid garment when in 2 in 1 'Combo' mode. This is a tough one, if I had to be picky I might say that the cuffs were just about wide enough to get my hands through. I do have 'shovel type' hands that are not small, if you have extra big hands you might struggle to thread them through the cuffs on one fluid movement. Comfort, ease of use and nothing that will keep you warmer or drier. The boys at Northcore seem to have done good. If you have not used a changing robe before then I recommend thinking about it and testing before putting yourself in the 'eyes on' situation that I had. The Beach Basha Pro comes in at a cool one hundred and fifty-nine Euros. For me, that's about the same price as a standard summer wetsuit so it is an investment. The reaction to the price when I asked a number of my surfing peers was generally that it was too expensive. I would say that it is a lot of money to shell out but you certainly get what you pay for. As I have said the item is all about quality and is a premium garment, you get the feeling that a lot of thought and expense has gone into the design and materials. Most of my peers agreed with this once they had actually held and inspected the Basha. So to sum up price: Expensive but worth every penny especially if you live in a location where you will use all the different variations the Beach Basha Pro has to offer. To date I have used the Beach Basha Pro about ten times and I can find myself both falling in love with it and also sure that it will stand the test of time as far as durability goes. It is a well-made piece of kit. Swinging in the winter wind. Using the Northcore Magnet Hook on my van to hang the Basha (review coming on the magnet hook soon). I will follow up with another article in six months to let you know how it fares in the long run. Anything else I would have liked to have seen included? These days you almost feel obliged to include something green or eco about the product and I did not see this in the Beach Basha but that does nothing to detract from the product itself. Purely a wishlist type of thing. The emergency surfs up call came in and we downed tools. Single, twinny and the Basha. Maybe, and I am just being picky here, the use of a zip up pocket to keep your ear plugs/wax/fin key in. These days there are a lot of things you have to take to the beach and keeping it all in one place is a mission for yours truly. So, overall the Beach Basha Pro from the guys at Northcore was a winner. It managed to sway my opinion on whether these products have a place in the surfing world. Not only did I have a changing robe but it would appear that I have the best and most comprehensively thought out changing robe. The price seems high but it really is worth the extra, you get a lot of bang for your buck. On the drying rack after a testing. Would I buy one? I am afraid I would have to say yes, if only to see the smile on my postman's face one more time. Extra Testing: The review has ended and this just a bit extra I wanted to fire into the article. I am sure that Matt and the guys at Northcore did not intend it but what they have created can be used for many other things. I have two comedians with fur (commonly known as dogs), they are very active and need a lot of walking, they also don't seem to care if the weather is mostly water falling from the sky. I thought a good waterproof test might be to use my Beach Basha for walking the furry funnies. As the Beach Basha comes down to mid-calf, I can slap on a pair of wellies, put the hood up and be dry all over. I have tested this on a number of occasions ranging from torrential to drizzle. Not once have I come back even slightly wet. Who needs to spend money on an expensive wax or waterproof jacket when you have a two in one solution. The Northcore website says 5K waterproof but I have not found a limit to the waterproof properties yet. In true Surf Bunker style we will be following up with a durability article in 6 months to let you know how the Basha fared. There we have it. A good dog walking coat which you can occasionally use to keep warm when changing in or out of your wetsuit. Worth every penny. -A secure pocket it the Basha on the outside for securing your other accessories. Wider handcuffs for people with bigger shovel hands than mine. It's like Christmas all over again. A true testament to the innovation that goes on behind the scenes at Northcore. Well done boys, can't wait to see what's next. Here she is, the extra layer. Well two actually. The Beach Basha Pro from Northcore. Proof that the Beach Basha works away from the ocean. Getting ready for some winter sunny day action. The question is, twin or quad? The Beach Basha Pro comes in three colours. Black, red and this example in blue. The humble but revolutionary Keypod. Showcasing the inner towelling part of the Basha. The two parts zip together with ease. I normally struggle with these zippy together things but this was super easy and speedy. The twin layers of the Beach Basha Pro zip together super easily. It really is cool to have two or three options in one garment. I was sure that a suitably cold day was not far away given how this winter was extending. I hope he has more than a towel to help him getting changed.